While it appears that the remake/reboot/re-imagine cycle has slowed, it has not stopped completely (and as long as any of these movies make money, it never will). And most of these movies continue to be completely unnecessary and often useless. However, every once in a while, someone comes up with a clever idea. I think that most would agree that the last thing which we need is yet another version of Cinderella. But, no one knows how to get blood from a stone like Disney, and armed with a talented director, a notable cast, and a somewhat interesting idea, they bring us a new take on this classic tale. Ella (Eloise Webb) lives with her father (Ben Chaplin) and mother (Hayley Atwell), and they have a wonderful life in the countryside. However, Ella's mother gets ill and dies, leaving her to be the sole companion to her father. However, Ella (now played by Lily James) doesn't mind this. One day, her father returns from his travels to announce that he's met a woman that he wishes to marry. Soon after, Ella's new stepmother (Cate Blanchett) and her wicked daughters, Drisella (Sophie McShera) and Anastasia (Holliday Grainger), move in. When tragedy strikes, the stepmother is placed in charge and she makes Ella little more than a servant. When it is announced that a royal ball will be held so that the Prince (Richard Madden) can find a bride, Drisella and Anastasia jump at the chance to go. But, Stepmother forbids Ella to attend, crushing the girl's dream. But, a Fairy Godmother (Helena Bonham Carter) is waiting in the wings to aid Ella with a little magic. All of that is not to imply that this movie is stale and boring. 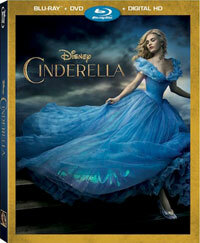 Having has success directing 2011's Thor, Disney roped Kenneth Branagh back in to helm Cinderella. (Which I'd completely forgotten about until the final credits rolled.) Is a director who cut his teeth on Shakespeare adaptations and then moved on to Marvel Comics films the right choice for this reboot? Apparently so, as Branagh keeps what could be a very trite and pedestrian moving from feeling as so. For starters, the color palette here is amazing. I'm not necessarily a fan of old movies like The Wizard of Oz, but I do love the sumptuous colors seen in movies like that. Here, the reds, blues, and greens nearly leap off of the screen, not only giving the movie a unique look, but acting to truly pull the viewer into the film. The other interesting choice is that this version of Cinderella not only a retelling of the old fairy tale, but it also plays as a live-action remake of the Walt Disney's 1950 animated version. It's not a shot-for-shot redo, but many, many of the same elements are here, from the production design to the costumes. (I haven't gone back and compared, but, if memory serves, some of the costumes are identical.) There's even some anthropomorphism here. The animals don't talk, but Gus Gus and the other familiar rats are here, along with the goose and lizards which are called upon to help with Cinderella's coach. Mimicking the animated version was a unique call and it acts as a treat for those who know that movie. Is this new Cinderella a home run? No, not really, as it can't escape the fact that it is a very old story and the film doesn't bring anything new to the tale. However, it certainly has enough charm to make it worth watching. Lily James, who plays a flirt on Downton Abbey, brings the necessary humility to the role and Cate Blanchett is very convincing as the woman who is driven by her petty jealousy. Helena Bonham Carter is great in her cameo as the Fairy Godmother, but her first appearance truly frightened me. As far as live-action versions of Cinderella go, Ever After is a much better movie, but it's also a darker movie. This new Cinderella won't change your world, but it does make for good family viewing. Cinderella allows a goose to steal the show on Blu-ray Disc courtesy of Walt Disney Studios Home Entertainment. The film has been letterboxed at 2.35:1 and the Disc contains an AVC 1080p HD transfer which runs at an average of 33 Mbps. The image is extremely sharp and clear, showing no notable grain and no defects from the source materials. The colors are amazing, with the reds, yellows and blues nearly leaping off of the screen. The picture is never overly dark or bright. The level of detail is very impressive and the picture is never soft. The depth is very good as well. The Disc carries a DTS-HD Master Audio 7.1 track which runs at 48 kHz and an average of 5.5 Mbps. The track provides clear dialogue and sound effects. The stereo effects show nice separation and the sound smoothly moves from side-to-side. The surround sound effects are very detailed and individual sounds come through at times. The subwoofer effects really add to the carriage ride scene. The Cinderella Blu-ray Disc contains a small assortment of extras. "A Fairy Tale Comes to Life" (9 minutes) examines the history of the Cinderella story and the cast's memories of the 1950 version. From there, Branagh and his team talk about their approach to this new film. "Costume Test Fun" (3 minutes) is a brief reel showing test footage of how the costumes of various characters would look on film. "Staging the Ball" (11 minutes) takes us inside the royal ball scene and looks at the costuming, the set design, and the choreography. Branagh introduces the "Alternative Opening" (3 minutes) which showed more of Ella's childhood. "Ella's Furry Friends" (4 minutes) takes us behind-the-scenes to meet the animal trainer and to see the animals at work. The final extra is the short "Frozen Fever" (8 minutes) which features the hilarious "Dry Banana Hippy Hat".